The Thai capital is a metropolis of juxtapositions, and there is no shortage of fun things to do and exciting places to visit in Bangkok. Modern skytrain mass transit lines hover above the glistening roofs of ancient temples, weaving together an urban tapestry of cultural treasures and holiday pleasures. Top class chefs plate epicurean masterpieces steps away from hawkers preparing delectable street food celebrated the world over. Bustling mornings spent diving into the city’s multi layers of leisure meld into fun nights sampling the Bangkok nightlife. SO-wasdee ka, welcome to Bangkok. 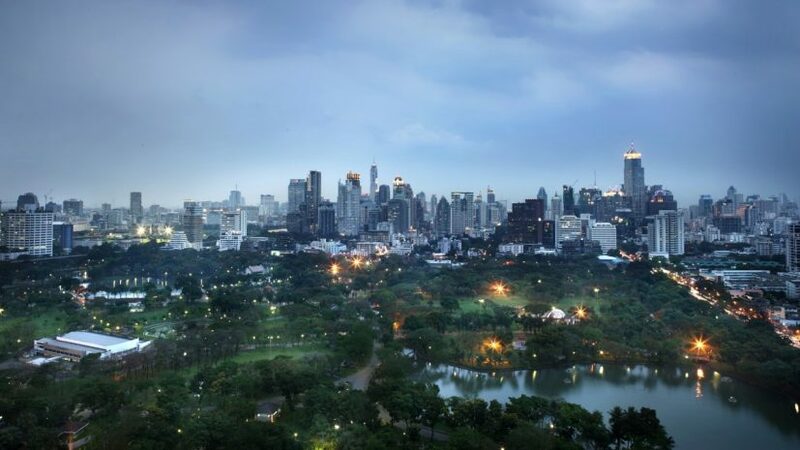 Bangkok is a city that never sleeps, beckoning her guests to explore the best places to visit in Bangkok for shopping or to get a taste of the local art scene at an exhibition in Bangkok. For a curated selection of attractions, restaurants, watering holes, retail and other activities, cherry-picked to get you started on discovery, contact the SO Sofitel Bangkok City Guru for an insider's Bangkok destination guide covering all the best places to visit in Bangkok. There is no shortage of fun things to do in Bangkok with the family. Just next door to SO Sofitel Bangkok is Lumpini Park, a 142-acre sprawl of lush greenery where families can explore on bicycle before picking out a shady spot for a picnic by the lake. Asiatique by the river is one of the city's best night markets for visitors of all ages; live entertainment stage shows, a ferris wheel, carousel, rides, and other facilities make it one of the easiest places to visit in Bangkok at night especially with kids in tow. Other top-rated places to visit in Bangkok with family include Sea Life Bangkok Ocean World, Kidzania, Madame Tussaud's Bangkok, and Safari World. Of all Bangkok attractions, its retail establishments are probably the most well known. From flea markets to swanky temples of retail, there are plenty of places to visit in Bangkok for shopping, haggling, and splurging. Chances are, anyone who has been to Bangkok will say one of its most pleasant places to visit in Bangkok are its shopping centers which offer everything from children play centers to expansive supermarkets and the latest fashion from local designers. Siam Paragon, one of the best places to visit in Bangkok with family thanks to kid-friendly tenants including Kidzania and the Sea Life Bangkok aquarium, happens to also be one of the city's retail giants and home to several flagship stores. Connected by the Sky Walk a short stroll away, Central World Plaza is the largest shopping mall in Thailand, and between the two, guests can browse for days on end. Other shopping centers worth checking out include Terminal 21 for a boutique shopping experience and Emporium and EmQuartier nearby for luxury brands and upscale shopping sprees. When all else fails, Chatuchak Weekend Market, one of the largest markets in the world, is the go-to place for bargain shopping for everything from clothes to collectibles, food to furnishings. Bangkok nightlife is more than just clubs and bars. Shopping and eating last well after the sun goes down at the numerous places to visit in Bangkok at night. As any local where to find the best street food in town, and chances are they’ll point you to Chinatown’s Yaowarat Road for good reasons. For some two centuries, the vendors and shops here have formed the trading hub of the Chinese community in Bangkok. By day, gold shops and market stalls still do a roaring trade. By night, when the neon lights flicker on, its one-kilometer strip’s culinary treasures help make Bangkok a destination for foodies from around the world. For a eat-and-shop leisure combination, Khaosan Road and Ratchada Night Market cater nicely to both, while the trendy establishments on Thonglor-Ekkamai infuse plenty of swagger to your Bangkok dining and wining. For a little something different, hop on a Tuk Tuk Night Tour to see the best of Bangkok attractions in another light from one of the country's iconic modes of transportation. If SO Sofitel Bangkok has awoken your artistic side, there are a few Bangkok attractions designed to inspire and motivate. Located smack in the center of the city’s shopping central, Bangkok Arts and Cultural Center comprises a café, bookshops, restaurants, and art library, and acts as a cultivator of creativity and promoter of contemporary arts. Contemporary Thai art is also showcased at the Museum of Contemporary Art (MOCA), which hosts regular art exhibitions in Bangkok. From its new home in Bangkok's old general post office building by the river, Thailand Creative & Design Center (TCDC) encompasses dedicated space to host regular creative showcases, as well as a Material and Design Innovation Center for art-inclined visitors. When the sun goes down, Bangkok nightlife establishments wake up to bring on the good times. Located not far from SO Sofitel Bangkok, Silom Soi 2 is lined with friendly bars which welcome visitors from all spectrums of the rainbow. If it's an upscale tippling experience you seek, complete with master mixologists and themed decor, head to Maggie Choo's or Sing Sing Theatre for a night to try to remember. For one of the longest-standing places to visit in Bangkok with a down-to-earth vibe, let your hair down and dance the night away at the after-dark joints tucked away amongst the stalls and carts that flank Khaosan Road. With its good healthcare system and holistic wellness purveyors aplenty, it's no coincidence that many Bangkok destination guides tout the Thai capital as a medical tourism hotspot. The city is home to several internally accredited hospitals including Bamrungrad Hospital and BNH Hospital. Guests who want to stay on top of their game have a suit of world class health and beauty providers, including TRIA and Apex medical spas offering a range of integrative medicine combining the best of eastern and western medicine plus medical aesthetic treatments. To complete the wellness transformation, the city offers professional Thai massage parlours and indulgent spas, including Oasis Spa, as well as fitness studios such as 911 studio where dance and fitness worksouts never felt so good.